We offer emotional health talks in local schools. We support the Samaritans Listeners in Long Lartin prison. Our volunteers answer phone calls, emails and texts from callers. Callers are welcome at the door from 8 am to 10 pm Monday to Thursday, Saturday & Sunday; 12:30 pm to 10 pm on Fridays. No appointment necessary. Please ring the bell and wait for a volunteer to open the door. Sloped access (via door at the top of the drive, furthest from the street) and adapted toilet. Cheltenham Samaritans have offered emotional support to people for over 50 years. It doesn’t matter who you are, or what you are going through, if you are finding things tough please get in touch with us and we will always listen. Samaritans Cheltenham and District, a charity registered in England (1170900). 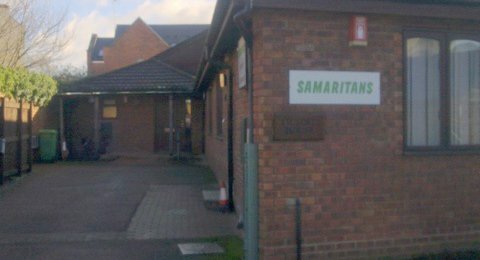 Samaritans Cheltenham and District is a recognised branch of Samaritans.